Place the squash, celery, carrots, mushrooms, garlic, stock, kamut, herbs and spices in a 4 quart slow cooker. Cook on low for 8 or so hours then stir in the chicken and collards. Cook for 20-30 minutes to warm the chicken through and wilt the collards. *I used frozen because it was on sale and after asking the Twitterverse for positive experiences. This winter has been so freakish. One day it is sleeting and snowing and freezing raining and the next it is 60 and sunny. It makes it difficult to meal plan. One day I feel like soups and stews and the next, I want to break out the grill and smoker. I like collards but they require a bit of effort to use; they are often gritty and and have a thick center stem that needs to be removed. They are also sold in such large quantities, we end up eating them for days afterwards. So when I spied a bag frozen, chopped collards, I tossed them in the cart. I didn't think (and still don't) they'd be good used in the traditional, long cooked way(similar to how I made turnip greens) but they are perfect to adding to dishes where you need just a bit of greens. 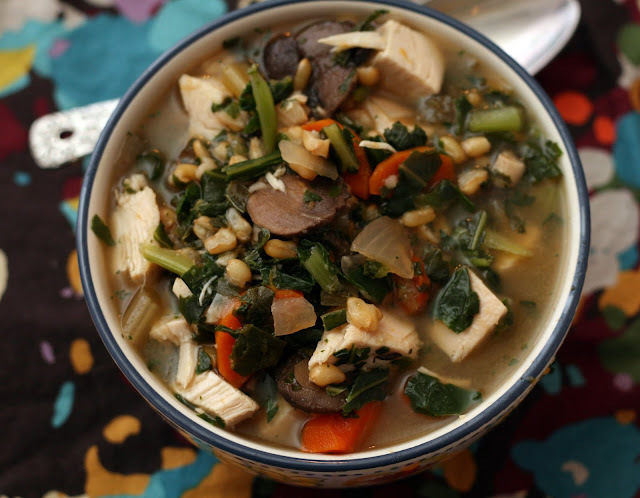 They're a great alternative to spinach in so many things, including this soup. Full of hardy ingredients like kamut (aka, Khorasan wheat) and root vegetables, this soup is perfect for dinner on a cold, blustery night. As an aside, collards are considered an "ancient green" just as kamut is an "ancient grain" so all the more reason to pair the two together.